I've been spending some time playing with my new blog which means I've seen a lot of my yoga cows on the banner heading at the top there. I've also been doing a lot of crochet, working on my 6 Ball Blanket. 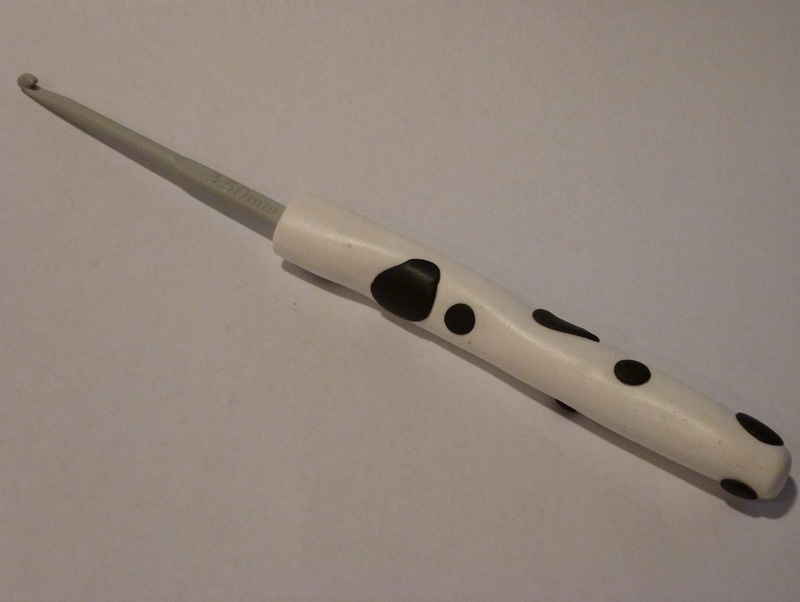 So it seemed completely obvious that I should link those thoughts and make myself a cow crochet hook. Have you ever used fimo? Also known as polymer clay, you buy it in different colours and mould it, shape it and bake it at a low temperature in the oven for about 20 mins until it hardens. Brilliant! This is what you need - a crochet hook (made of metal), and some white and black fimo. 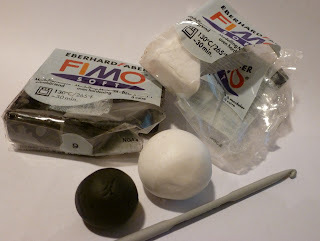 Soften the fimo in your hands to get it pliable and roll a ball of each colour. 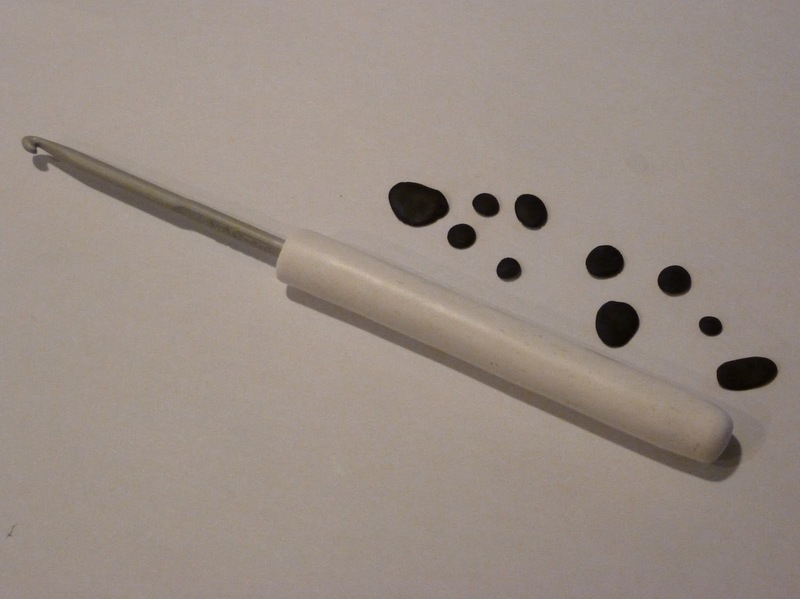 Roll the white ball into a stumpy sausage shape and push the end of the crochet hook into it but don't let it pop out of the end. Then roll it out until the white fimo covers half the hook. 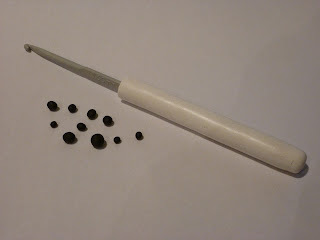 Roll tiny balls of black fimo. 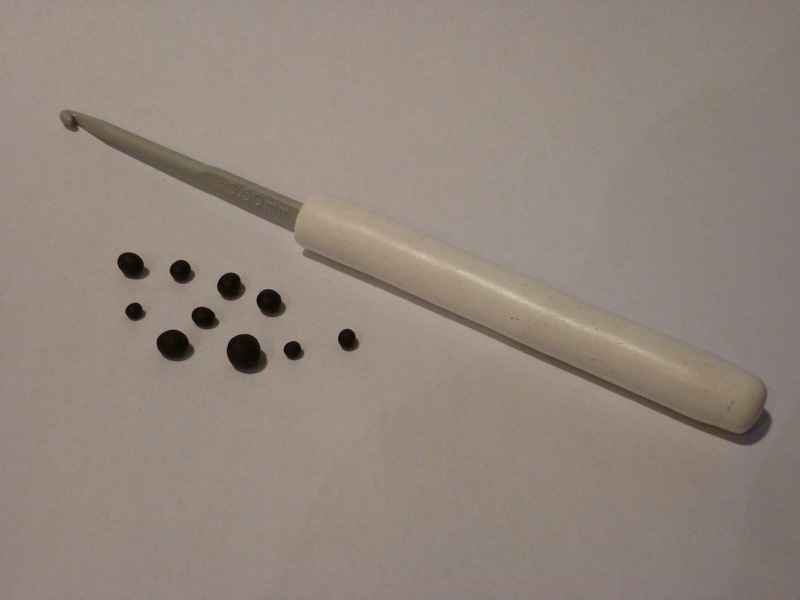 Use your finger tip to squish the tiny black balls flat and into irregular shapes (think cow thoughts) then press them gently onto the white cover. 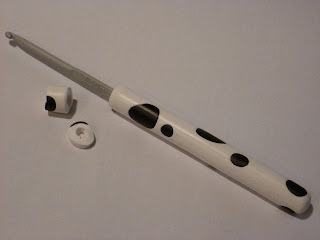 Your neat, smooth sausage shape cover will get distorted by this but don't worry, we'll sort that out once you've pressed all the black spots onto it. 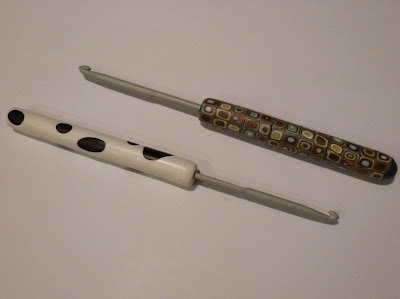 Now roll the spotty cover until the black softens into the white clay and it's even all round. Then run a knife around the edge half way down the hook to cut off the excess and make a neat edge. You want to make sure you can see the size marked in the middle. And you're done! Bake according to the instructions on the pack. If you like, you can sand it down and varnish. I got all giddy about my cow crochet hook so I found a Gustav Klimt inspired polymer clay cane I made ages ago and covered another hook with that. 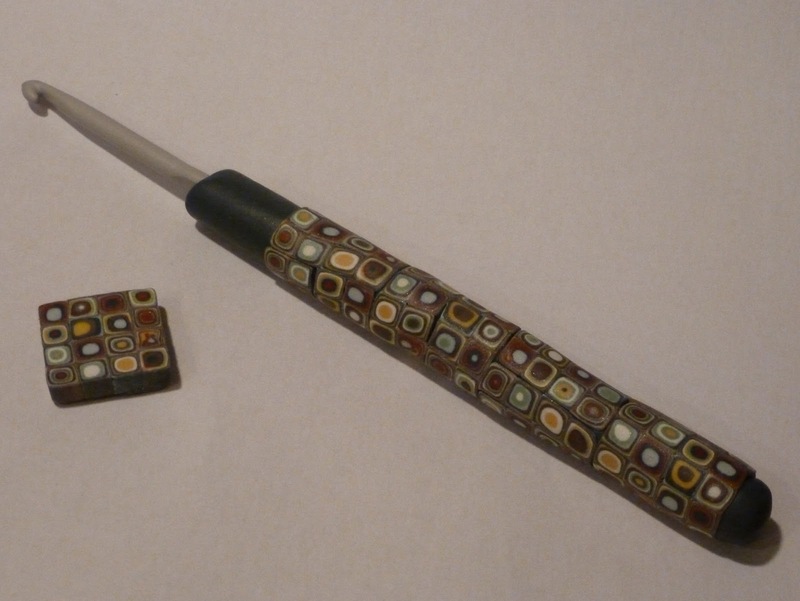 Canes are like a stick of rock, they have a design which runs all the way through the middle. To use a cane you cut thin slices from it. 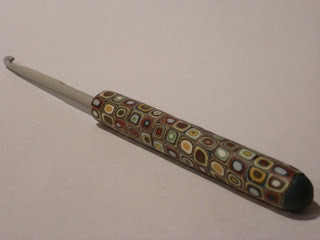 The book I learned from is Donna Kato's "The Art of Polymer Clay Millefiori Techniques"
Love your personalised crochet hooks - the cow one is so fun! Thanks Judith - I've had a quick peek at your daughters site. She's gifted!